Last week, I had a four-day weekend. It was great! I went to Glen Park in River Falls, WI and took engagement pictures for our friends, Jon & Kelley. It was a perfect day and we were at the park at the perfect time. They were even willing to get in the water (even though I got wetter than they did!). We also spent some time on the St. Croix River. There was a professional walleye fishing tournament going on, so Paul and his dad had to go out and see the pros. :c) We also attended the final weigh-in to see who won. With the holidays coming up, I'm working on making cards more easily available on my site. Right now, you can order cards, but that isn't very obvious. In the future, you will still need to order cards through me rather than my site, but I will have a gallery that will make it easier for you and for me. Oh! One more piece of fun news! 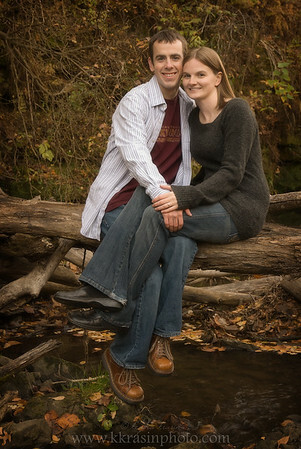 Go to Yahoo and search for "engagement photos hudson wi"... look at the results... Guess who is number 3??!! Me! I was really excited, and a little confused, when I saw that. Unfortunately, I don't come up if you do the same search on Google.